Public art defines areas, or even entire cities. So what pieces have that resonance here in Wichita, and how do they get approved and created? Whether it’s the Charging Bull on Wall Street, the Bean in Chicago’s Millennium Park or the St. Louis Arch, public art goes a long way to define an area, or even an entire city. Scrolling through Facebook or Instagram, you instantly know what city your friend is in if you see them posing with any of these iconic pieces. So what pieces have that same type of resonance with Wichita? The statues along Douglas? The Keeper of the Plains? Maybe the new grain silo mural in north Wichita? "Public art tends to be those elements within the built environment that create that unique sense of place," says John D’Angelo, director of arts and cultural services for the City of Wichita. "Sometimes it’s hard to separate where’s the art, where’s the architecture, and that’s not a bad thing." 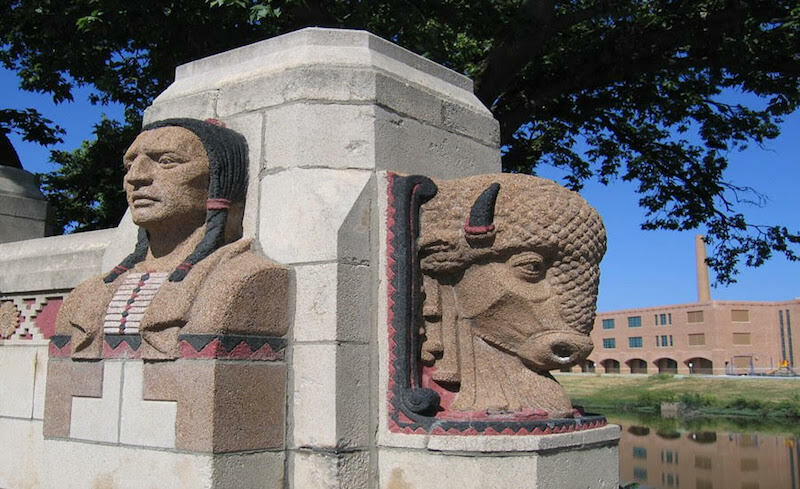 In Wichita, public art runs the gamut of sculptures, architecture, statues and murals. D’Angelo says the Minisa Bridge on 13th Street by Lawrence Byers is a prime example of creating a sense of place as it mimics the architecture of North High, which was designed by sculptor Bruce Moore. ‘Tripodal’ by James Rosati at the NW corner of Century II. ‘Paragon’ by Albert Paley at 400 E. Waterman Street. ‘Business Man Cooling His Feet’ by Georgia Gerber at the corner of Douglas Avenue and Main Street. ‘Mother and Son Pointing’ by Georgia Gerber at the corner of Douglas Avenue and Broadway Street. ‘Girl Leading Pony’ by Georgia Gerber on Douglas Avenue between Market and Broadway Streets. ‘The Musician’ by Georgia Gerber on Douglas Avenue between Market and Broadway Streets. ‘Soda Fountain’ by Georgia Gerber on Douglas Avenue between Market and Broadway Streets. ‘Scooter Boy’ by Georgia Gerber on Douglas Avenue between Market and Broadway Streets. ‘Bison’ by Randall Julian at the Chisholm Creek Nature Center Trail. ‘The Jester’ by Dorothy Koelling at Century II, 225 W. Douglas Avenue. "When you talk to people in Wichita and you say ‘North High’ or you say ‘the [Minisa] Bridge,’ those images start to resonate with the public," D’Angelo says. When images resonate with the areas they’re built to represent, that’s when you start creating that sense of place — almost like a brand for the city or neighborhood. The Horizontes project has created a visual language that represents the neighborhoods of north Wichita. "Again, I think it identifies that idea of placemaking and uniqueness that your community is known for," D’Angelo says. "You’re wanting that uniqueness that makes us unique and different from Kansas City or Tulsa, and how you define that. That art, which is part of that self-expression of the community, is what makes that." But public art goes beyond creating a cohesive perception of a place by supporting the artists who create the public art itself, and by creating a system that creates a more artful community as a whole. Not all artists specialize in public art, but for the ones who do, it can be an immense opportunity to have your work showcased in front of the entire city. "Not every artist is a public artist, and that’s okay," D’Angelo says. "Putting all artists in one bucket is really difficult and, unfortunately, when you use the word ‘art,’ that’s what happens. There are many different fields of artists." Even within the field of public art, disciplines and backgrounds are extremely varied, says Vicki Scuri, a Seattle-based artist who has done several Wichita projects at the intersection of public art and infrastructure. "Anyone who works in more traditional media — you know, drawings, paintings, sculpture — to people who are working more in digital design and fabrication, to landscape architects," she says. "You have a much broader base of people wanting to be public artists. … They see they have a much bigger placemaking role to play." Scuri’s projects in Wichita include the Lewis Street bridge that crosses the river at Lewis and Douglas, the wind screens at the Wichita Art Museum and the integrated art within the Kellogg project in east Wichita. The architects, artists, sculptors and others creating art we all see on the street have the challenge of not only creating something aesthetically interesting and tasteful, but also creating something that represents the public — and can continue representing the public for as long as possible. "So what makes it public art, I think, is maybe an experience for the community — that it creates identity for the community," Scuri says. "It gives people a voice that maybe they wouldn’t have otherwise." Unfortunately, not all art meets that standard. In the southern United States, sculptures were created to commemorate the Confederacy. Those communities are still grappling with how this art represents their past — and whether or not they have a place in the present. ‘The Douglas Avenue Bridge Towers’ on West Douglas Avenue by Vicki Scuri. ‘Cheetah’ by Bart Euwonus and Chris Brunner at Zoo Boulevard and Windmill Road. ‘Gorilla Family’ by Bart Euwonus and Chris Brunner at Zoo Boulevard and Windmill Road. 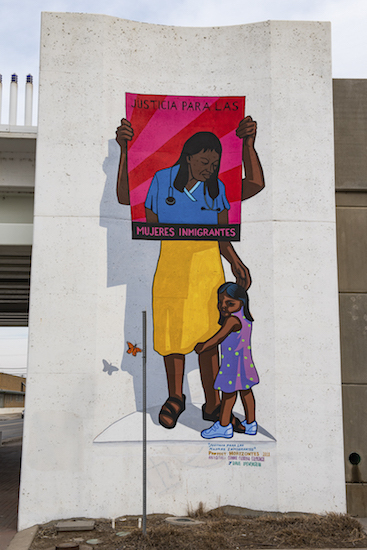 ‘Justicia Para Las Mujeres Immigrantes’ by Connie Fitzpatrick and Dave Lowenstein at Santa Fe and 13th Streets. 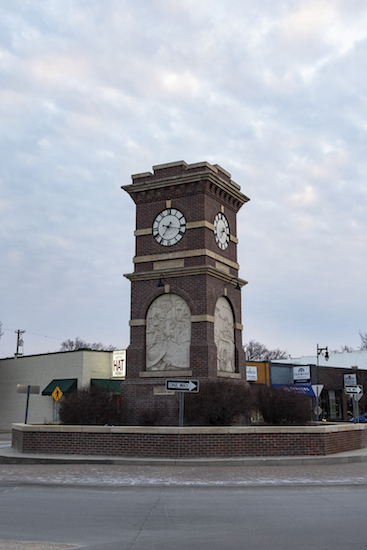 ‘Delano Clock Tower’ by Kiv Yankey at Sycamore Street and West Douglas Avenue. ‘Light and Stage Installations’ by Kent Williams and Stephen Atwood at 500 S. Commerce Street. ‘Red Bud Trail Head’ by Tina Murano, Todd Whipple, Janice Thacker, Charles Davis and Norm Terry at 3912 E. 13th Street. 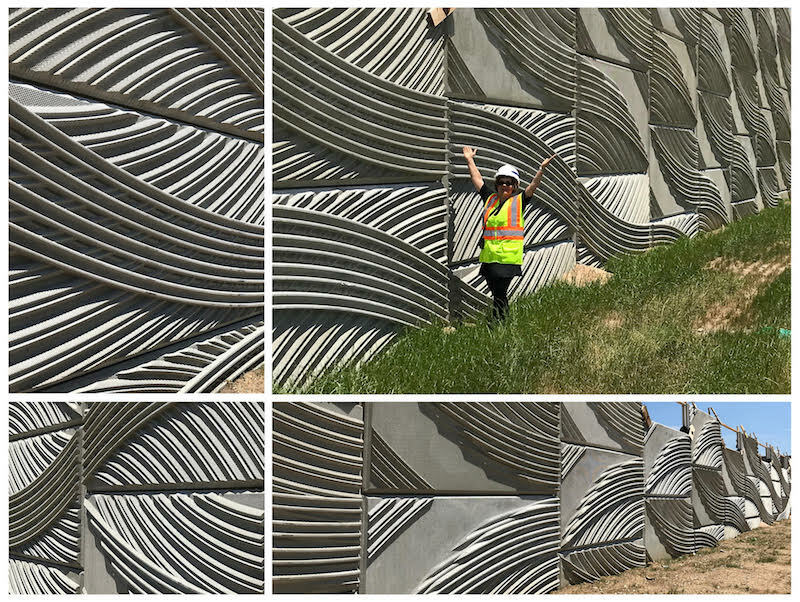 ‘Hobo Language Panels’ by Law-Kingdon Architects, Gardner Design, Lightworks Kansas City and TranSystems at the E. Douglas Street Underpass, Douglas and Santa Fe. ‘Douglas Underpass Light Panels’ by Law-Kingdon Architects, Gardner Design, Lightworks Kansas City and TranSystems at the E. Douglas Street Underpass, Douglas and Santa Fe. 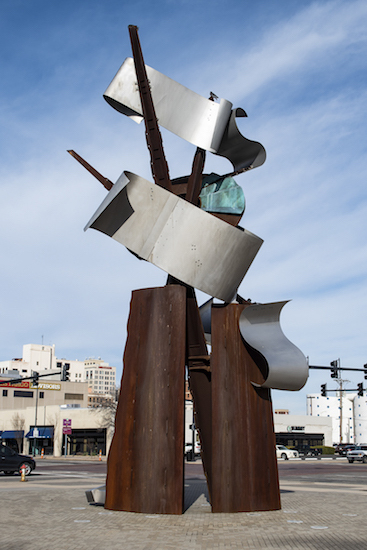 ‘Wind Spirit Gateway’ by Robert Roesch at 600 S. Main Street. ‘Minisa Bridge’ by Lawrence Byers at 13th Street and the Arkansas River. Scuri says the flip side of that is the Horizontes mural project, which has sought to represent the communities of north Wichita through the art painted on the walls and infrastructure of their neighborhoods. The Horizontes grain elevator mural by GLeo. "From an artistic perspective, it’s a different way of challenging yourself artistically and how you’re engaged," D’Angelo says. "You’ve got to recognize that that type of artwork has its own dialogue it creates with it." D’Angelo says it’s okay not to like public art. But it’s the government’s job to ensure public art is vetted so that it truly represents the community it’s being created for. "It doesn’t mean everybody’s going to love it, and that’s okay," he says. For the artists who do take on the daunting work of creating public art, it can be rewarding, both in terms of money made for a commissioned piece and the opportunity to create something lasting and large-scale. "I think it’s another way for artists to, again, depending on their own skill sets, be able to work on a scale that they typically don’t get an opportunity to," D’Angelo says. "You know, we’re fortunate that we do have some local sculptors who do some nice-sized work." Having public art as part of a public project goes a long way in supporting the local arts scene. But not every artist who creates public art in Wichita is actually from that local scene. Wichita may be the biggest city in Kansas, but that doesn’t mean our local arts scene meets every demand for every public project. Artists like Scuri fill the gaps, while pushing the local arts to accomplish bigger projects. Scuri says this is normal, even for her, as most of her work is done outside of Seattle in cities across the country. "My early work is in Seattle, and my more mature work is almost everywhere else," she says. "I say maybe 10% of my work may be in Seattle." D’Angelo says artists who are brought into a city can often act as a catalyst to spark interest and a sense of competition in the local arts community. "I think you want to challenge your local artists always," D’Angelo says. "Now, I think some of the artists will argue that. You know, they want those opportunities, and I think they should have them, but I think they also need to understand it’s a competitive world. How we compete artistically is equally important as having local-driven art. I think every public art program always has to balance those two things." Scuri says she also hires local interns, which can help young artists get experience on a large-scale public project. 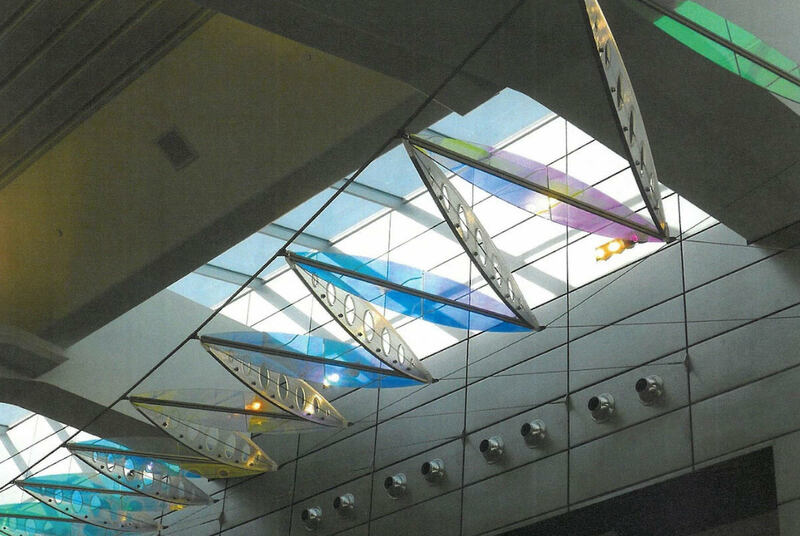 Other artists, including Florida-based Ed Carpenter and New York City-based Albert Paley, have contributed to projects like the glass work at the Eisenhower National Airport and the large metal sculpture near the WaterWalk Hotel, respectively. But both of these artists are known nationally as public art and sculpture specialists. Sometimes, D’Angelo says, it’s worth hiring the expert. That being said, many designers and developers in charge of a project involving public art prefer hiring local simply because of the cost. ‘Mayor Curry’ by Stephen Hesse at the Wichita-Sedgwick County Historical Museum, 201 S. Main. ‘Veterans Memorial’ at Veterans Park, 503 W. Central Street. Artist is unknown. ‘Ben E. McLean Fountain’ at River Vista Park, 200 N. McLean Boulevard. Artist is Unknown. ‘Gargoyle’ by Stephen Hesse at the Wichita-Sedgwick County Historical Museum, 201 S. Main. ‘Neon Light Shades’ by Steve Murillo at Old Town Plaza, 2nd Street and Meade. ‘Butterfly Tile Mural’ by Tina Murano at the West Douglas Park Shelter, 3201 W. Douglas Avenue. ‘Concentricity’ by Conrad Snider at the Advanced Learning Library, 711 W. 2nd Street. ‘Woven’ by Kent Williams and Stephen Atwood at the Advanced Learning Library, 711 S. 2nd Street. "The tendency by the designers is to push back from that," D’Angelo says. "If you’re bringing an artist in, you’ve got travel expense, you’ve got all that." Rather than put further pressure on developers to hire local, D’Angelo says he’d rather see our local artists get more opportunities outside of Wichita. "It’s great to see that kind of recognition on a national level," he says. "Unfortunately, our locals haven’t had that opportunity yet." But many in the community are advocating for more support for public art, which could at least open up more local opportunities for local artists. If public art has all of these benefits to our artists, our communities and our city’s perception at large, it stands to reason that more of it is better. Currently, the process for selecting public art projects in Wichita is defined by the Design Council, a committee of local architects, artists and designers. "They review the capital improvement program (CIP) on an annual basis, and they select projects that they call ‘special considerations,’" D’Angelo says. "Basically, those are highly visible areas with a lot of pedestrian traffic." Once a project is selected, the Design Council would make a recommendation for artist inclusion and set a recommended monetary amount. D’Angelo says the amount for each project comes out to about 1 percent of the budget across all of the projects selected. "Some may be 8 percent, some may be a half a percent, some are nothing," he says. "If you look at the entire CIP, it’s less than 1%, but it just depends on the projects and the scope of the project. I mean, you know, some projects are million-dollar projects, some are just a few hundred thousand." After that amount is recommended, local architects, developers or designers will try to find an artist to participate on the project. That’s when someone like Scuri would be brought in to consult and design as part of the team. "To work in infrastructure, you almost have to be part of the design team," she says. "Not all cities allow you to do that, but Wichita did allow me to do that, and that’s why I could create the East Kellogg project the way I did. Because it’s interdisciplinary work, you know?" For cities like Wichita, this process isn’t necessarily the norm. In more than 320 cities across the country, public art is funded at a level of 1 percent of the entire CIP, which is a five-year strategic plan for all city improvements, not just the projects selected by a Design Council. Wichita’s adopted CIP for 2018-2027 totals $1.76 billion over 10-years. That would leave about $17.6 million for public art over the next decade. "I think it’s one way, in sort of a really neat package, to manage the public art in a public city," Scuri says. "But it also has its limitations because, often, the percent isn’t big enough to do something like the Kellogg project." Scuri says the percent for art idea is a "winner," and has been proven out across the country. But she says Wichita also should keep in mind larger projects that exist outside of that percent. She says Wichita also needs to keep its team mindset when it comes to design. "I think you need it all," she says. D’Angelo says a percent for art program would likely bring with it additional funding from the private sector, enhancing what the city is already doing when it comes to public art. "I think a percent for art program is your best solution to doing public art," D’Angelo says. "It usually spurs private commitment as well, so you have the added value of getting the private sector to start supporting the idea of putting art within their projects, so I think it serves two purposes: It helps on quality of life, it helps on placemaking. It’s kind of that catalyst. It starts creating these spaces that, again, we want to go to." D’Angelo says a percent for art program was considered in the ’90s, but never passed due to a lack of support on Wichita’s City Council. He’s hopeful it will have the support it needs if it were brought up again. If passed, D’Angelo says the funding could go much further than project-based art. Currently, there is no budget for art that would exist outside of capital improvement projects. "Unfortunately, right now, with the structure, it’s all tied to creating object-oriented, integrated-approach pieces," D’Angelo says. "It’s not all about just visual art, so with that kind of money, you could diversify in terms of the types of art that you’re doing." Public art is an important piece to ensuring Wichita is a unique place to live and visit. It’s up to all of us to ensure it is made a priority by our elected officials. Like the name suggests, public art belongs to all of us. Scuri says this aspect of public art is especially important in a city like Wichita. "In Wichita, I think you create your amenity there because you’re kind of in the middle of the country," she says. "You’re not near an ocean, and you’re not near the usual things like other big cities. All the interest needs to be created there, and fostered there, and built there in some way." Currently, Wichita City Council is grappling with the percent for art issue. It could be brought up for a vote in the near future. If you think public art needs to be made a priority, contact your council member.